Without command and without notifying anybody, Jones laid the rifle on the picket fence, aimed and fired. 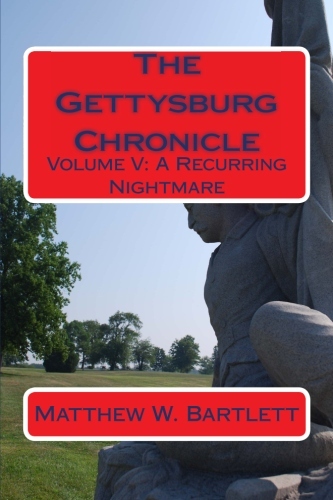 Volume 5: A Recurring Nightmare will deal with Barlow's Knoll and the action that took place on the 1st of July. Man of the men who fought at this location were Masons, and the book will have many Masons as characters. This is also the first time we will see characters from Connecticut! It's my number one asked questions at lectures, and I am pleased to have James Moore (with an appearance from Captain Fowler), from the 17th CT as one of my main characters. You can also expect to hear from Gordon, Barlow, and a wide cast of characters. This was supposed to be one of the shortest volumes in the entire series, but as soon as I delved in, there were too many stories that needed to be told. Little is written about Blotcher's, or Barlow's Knoll and I am proud to be one of the few authors to tackle this ignored part of the field.